Every budding cocktail enthusiast who wants to begin making cocktails at home will need some basic (and indispensable) tools of the trade. Here’s the problem: you could easily spend a small fortune on all the bar tools available to you. Since you are just starting out, I have narrowed the list to the five essential bar tools that will help you create tasty libations time after time. This is arguably the most important tool on the lineup. This isthe one tool where it all comes together.The advantage for having a three-piece shaker is the fact that you no longer need an additional strainer Since the strainer is part of the shaker. In some Cobbler shakers the top also doubles as a Jigger. It doesn’t matter how much experience you have making cocktails. 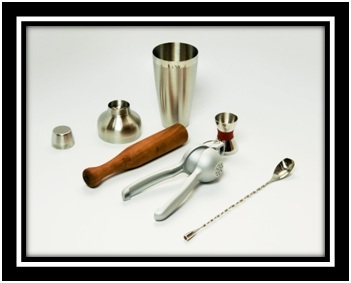 Novice or a seasoned professional– the jigger is the only way you will be able to make consistent cocktails. The muddler is an important, although nonessential, tool that will help you extract flavors of fruit, herbs, spices etc., by smashing the chosen ingredient. Not all muddlers are the same shape so pick one that is comfortable in your hand. There is NO substitution for fresh. If you really want amazing tasting cocktails, a citrus squeezer is an essential addition to your lineup. The Bar Spoon isn’t considered essential, but it is very important. This is especially the case if you are making cocktails that do not need to be shaken. Using only the tin part of the Cobbler shaker as mixing vessel use the long bar spoon to stir until cold. e.g. Martini, Manhattan, Negroni etc.